Workouts 1-5 focus on proper technique development with our most effective drills and movement cues so you lay the right foundation from day 1. Download all of the workouts (easier to print and take to the gym), in PDF format here. Note, the PDF doesn't contain links to the instructional videos. Or, bookmark this page and save it to your smart phone for easy access in the gym. One of, if not the most, fundamental movements in strength training and athletic performance is the squat, so we’re going to start here. If you can perform the squat safely and effectively you’re well on your way to being able to train productively. This workout will take you through the prerequisites required to execute the lift properly and then some progressively more challenging variations of the loaded movement. *Bonus: Review this video for 2 other methods of assessing your ankle mobility. 1.) Back Squat warm-up w/ bar 2x10 (focus on "screwing in the feet.") - Watch Squat Lesson 1. 2.) Back Squat warm-up w/ bar 2x10 (focus on "sitting back with the hips") - Watch Squat Lesson 2. *In other words, add a small amount of weight during each set until you reach a moderately challenging weight, but one that you can still perform with 100% confidence and proper technique. D.) 2-3 sets of front plank, for as long as possible. If you can do more than 90sec without much trouble, add weight to your back like this. E.) Optional: Moderate Cardio. For example, 10 sets on a stationary bike or assault bike, alternating between 30sec @ 85% of your max speed, then 30sec of rest. *In our method of notation, we write the number of sets first, then the number of reps second. So 2x10 means perform 10 squats (repetitions). Rest as needed (or with a specific interval if one is given), then repeat that sequence a second time by performing another 10 squats. The bench press is a gym staple almost everywhere, and for good reason. Few exercises do as good a job at building strength and muscle in the upper body. Similar to the squat foundations, this workout will take you through some prerequisites necessary for safe and efficient bench press execution as well as the bench itself. There’s also some additional upper body work, DB bench for extra shoulder, pec and tricep work and then some rowing variations to balance upper body development so you don’t end up with internally rotated shoulders. *If you can't complete both of the prerequisites, see below. 1.) 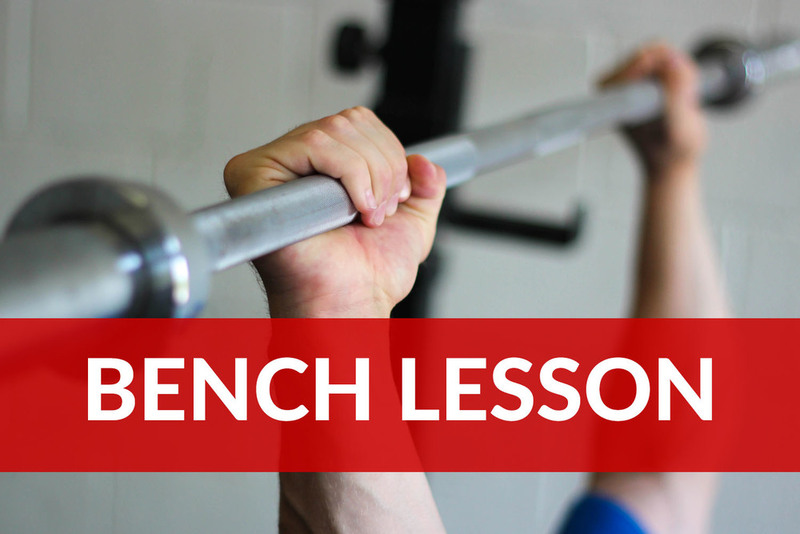 Bench Press warm-up w/ bar 2x10 (focus on "shoulder blades") - Watch Bench Lesson 1. 2.) Bench Press warm-up w/ bar 2x10 (focus on "bar path") - Watch Bench Lesson 2. 3.) Bench Press warm-up w/ bar 2x10 (focus on "leading with vertical elbows") - Watch Bench Lesson 3. 4.) Bench Press warm-up w/ bar 2x10 (focus on "driving through the heels") - Watch Bench Lesson 4. *Avoid loaded barbell bench press until your shoulder mobility and control is adequate so you can actually learn proper technique and so you don't damage your shoulder joint long term. In the meantime, perform dumbbell bench press in this manner. This workout introduces the pause above parallel squat, this variation will force you to maintain tension and position out of the bottom, which is a common weakness for most lifters. Also included is some single leg work for balanced left vs right leg development. When warming up with lighter weights, you can make slightly larger jumps in weight (generally not more than 50lbs for a beginner or intermediate). As you get closer to your heaviest set for the day, make smaller weight jumps. The deadlift is arguably the most primal and fundamental movements done in the weight room. It doesn’t get more basic than picking something heavy off the floor. This exercise has an enormous potential for strength, muscle and athletic development but can be dangerous if done incorrectly. Therefore this foundations workout will take you through the proper steps to ensure that you perform the deadlift in a way that is both SAFE and EFFECTIVE. If it comes up that you can’t safely pull from the floor don’t feel upset and definitely don’t be stubborn and do it anyways. Many lifters have to start with the bar slightly elevated and improve hamstring mobility before moving to the floor. Take your time and do it right and you’ll have a long lifting career reaping the benefits of this movement, rush it and you run the very serious risk of a back injury. 1.) Deadlift (with bar at mid-shin) w/ bar 2x10 (focus on "two-hand rule") - Watch Deadlift Lesson 1. *Crucial! Your back MUST remain neutral at this height. If not, elevate the bar on a 4-8" box, using whatever height is appropriate to maintain a perfect back position. The final core lift (and often the most overlooked) is the overhead press. This movement is a phenomenal tool for developing strength in shoulders, arms, chest and back. Also due its standing nature it does a great job of building strength and stability in the torso. This workout will take you through the basics of the overhead press as well as some additional movements needed for full development of the upper body.